Disaster is a team effort. Read this story about partners working together to help Florida’s small businesses recover from Hurricane Irma. Located in Jacksonville, Fiesta Catering, Inc/ A+ Lunch Company provides National School Lunch Program (NSLP) meals to K-12 students entitled to free or reduced lunches. The company is a Fresh From Florida and Farm to School-registered vendor that promotes local produce and small, struggling farms to the school markets, creating jobs for the local community. What type of damage occurred? We suffered a total loss of inventory and economic injury from the storm due to a loss of income from school closings. How will the Emergency Bridge Loan help? I would have had to close my business without this bridge loan. [It provided] extremely mandated help! 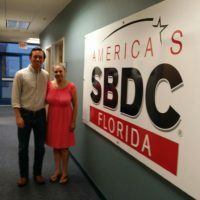 How helpful was the Florida SBDC at UNF? The services provided by [my consultant] Cathy Hagan and her team exceeded all expectations I even imagined or prayed would be possible. Administered by the Florida Department of Economic Opportunity, in collaboration with the Florida SBDC Network, and supported by Florida First Capital Finance Corporation (FFCFC), the Florida Small Business Emergency Bridge Loan is a short-term, interest-free working capital loan intended to help small businesses “bridge the gap” between the time of a declared disaster and when the business has secured long-term recovery resources, such as insurance proceeds or federal disaster assistance. Governor Rick Scott activated the Florida Small Business Emergency Bridge Loan program on Thursday, September 14 and the first loan was distributed the following Monday. Eligible businesses with two to 100 employees may apply for loans up to $50,000 for 90 or 180-day terms. As a principal responder in the state’s Emergency Support Function for Business, Industry, and Economic Stabilization, the Florida SBDC Network supports disaster preparedness, response, recovery, and mitigation through its Business Continuation Services. As part of its service offering, Florida SBDC professionally certified consultants and disaster specialists are available to provide confidential, no-cost consulting to help affected businesses prepare disaster loan applications and with other post-disaster challenges. "The services provided by [my consultant] Cathy Hagan and her team exceeded all expectations I even imagined or prayed would be possible. " - Melinda Miniel, President - Fiesta Catering, Inc.